With a little practice using a woodburning stove in the forest should not be a problem in any weather. Above the treeline, in arctic conditions, it is a different matter. Before going on a trip to Abisko I did some research on this topic. The best resource I have found when it comes to firemaking in the arctic comes from Yngve Ryd. For several years he has interviewed Saami people from Swedish Lapland and documented their knowledge of fire and other topics. This has resulted in many interesting books on particularly sharply defined topics such as snow, predators and in this case fire: "Eld, Flammor och Glöd - Samisk eldkonst". Unfortunately, as far as I know, it is only available in Swedish. For the Saami, making a fire was a matter of life and death. This is a very interesting book, not only for those interested in making fires, but anyone interested in Saami life in general. As a fire starter I used birch bark that I had collected previously, however I also once collected some cottongrass and used as tinder. It works well if you have enough of it and it's dry. This was the best fuel I found. 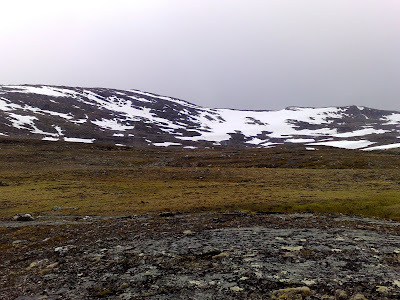 However, I only found far up north near Abisko. It is also recommended as fuel in the arctic in John Wiseman's book on survival. 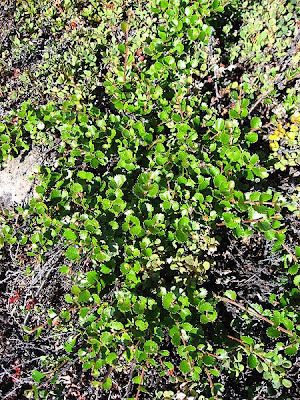 This is a very common plant in the Scandinavian mountains. It is present almost everywhere, except the high alpine areas. Birch branches contain some kind of oil which means they burn pretty well even when moist. Crowberry is even more common than dwarf birch. It doesn't burn as well though. Black crowberry. take the dry grey branches. Photo by Ante Aikio from Creative Commons. There are probably a lot of other fuels available. Willow will probably work very well. According to a Saami man in Yngve Ryds book you can even light green willow directly if slice it thinly. Juniper bushes should also be very good. The best bushes are often found next to rocks. If you go really high up there is almost no vegetation at all available. For these circumstances you need to either bring fuel from the valley or perhaps use Esbits. Four small Esbits should be enough to boil 8dl of water. The pot stand on top of the Bushbuddy works quite well as an erzats Esbit stove. A big thanks to Harald Igesund for this valuable tip. In the future I will try to publish some pictures on this setup. Gustav, this is a really useful report because as a Bushbuddy owner I have often wondered if it could be used so far north, it seems it can. A few Esbits as back up seems like the ideal option. I will also search out the book you mention, even if it is in Swedish. Many thanks. Gustav, also from me a big thumbs up for this excellent article. The photos make it a great resource and should help other BushBuddy (and other wood stove) owners survive in the north! Excellent! I've long been jealous of Hendrik and Roger and their BushBuddy stoves, thinking they would never be viable out here in the Norwegian mountains and now it appears they are! Thanks for the insight Gustav. Interesting reading! It is in fact a norwegian who inspired me. I have just emailed him , so that I can give him due credit.